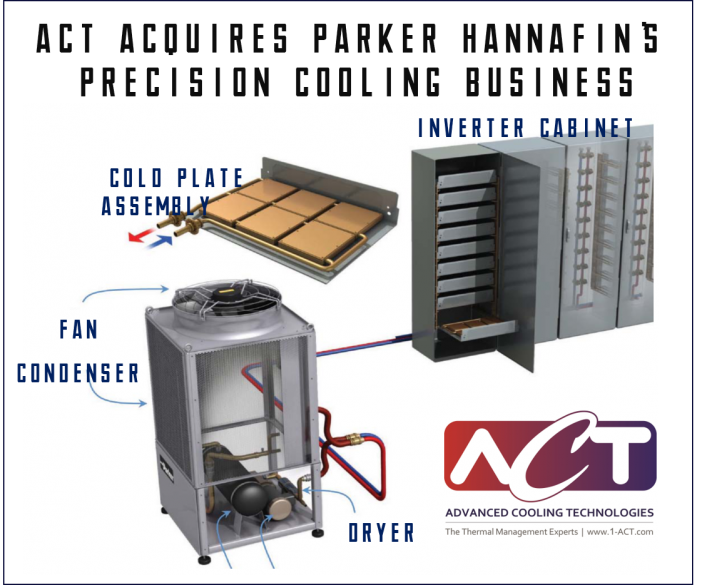 Lancaster, PA January 14, 2019 – Advanced Cooling Technologies, Inc. (“ACT”), a premier thermal management solutions company, announced today that it has completed the acquisition of Parker Hannifin Corporation’s Precision Cooling Business (“PCB”), a leading supplier of Pumped Two Phase Cooling products for power electronics applications. Following the completion of the acquisition, all the PCB assets were transferred to ACT’s Lancaster, Pennsylvania facility and integrated into its Industrial Products Group. Pumped Two Phase Cooling, also known as Pumped Evaporative Cooling, is an active cooling technology that utilizes the latent energy associated with the boiling of a working fluid to efficiently remove large amounts of waste heat. Compared with single phase cooling, Pumped Two Phase Cooling enables lower flow rate, reduction in system size, reduction in pumping power, higher heat flux (a measure of heat density) removal capability, more uniform temperature across the heat source surface, and practical use of dielectric working fluids such as refrigerants. For more information on how the technology works, please visit www.1-ACT.com/Resources/Pumped-Two-Phase-Cooling/. The Precision Cooling Business is a leader in designing and manufacturing refrigerant based Pumped Two Phase Cooling systems and assemblies. Its products have been used in cooling of electric drives, inverters, motors and generators, batteries, and other high power electronic devices. More information on ACT’s Pumped Two Phase Solutions, both standard and custom, can be found at https://www.1-ACT.com/Products/Pumped-Two-Phase-Cooling-Solutions/. ACT is a developer and manufacturer of advanced thermal management solutions for customers in diverse markets including Aerospace, Defense, Temperature Calibration, Medical Device, and Energy Recovery Systems. ACT’s Lancaster, Pennsylvania facility measures more than 65,000 square feet and is certified to ISO9001 and AS9100 quality standards. For more information, please visit www.1-ACT.com. Parker Hannifin is a global leader in motion and control technologies. For more information, please visit www.Parker.com.